With 10 issues in a year, Viz magazine has inspired many other magazines in UK to copy its style of making humorous comments and features but none of them could touch the popularity of the Viz. ** Digital Subscriptions allow you to read the magazine on any of the devices listed above. You will receive an email on completion of your order with details on how to access your digital magazine. Viz is surely a magazine for you if you have a great sense of humor and enjoy the funny captions over the funnier pictures. Viz magazine has been there since 1979 and ever since then it has hugely entertained its reader with quirky humor, nostalgic photographs, insane logics, top tips and funniest cartoon characters. The accomplishment of the magazine is determined by the very popular cartoon characters like Felix letterbocks, Sid the sexiest, Millie the foul mouthed man and fat slags. The regular features like Mr. logic and drunken baker and brown bottle adds to the total appeal of the magazine to present humor at its best. It often feature politicians and current affairs too but does not stands or make any statement. The magazine rather provides sheer humor and entertainment without making you learn about anything. 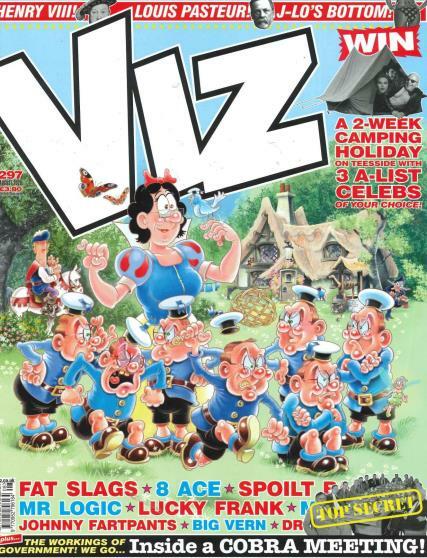 In spite of having quirky humor and bad language, the Viz magazine has enjoyed theglory of being the third most read and popular magazine in UK. The magazine also features the forgotten stars from 70s but again in a comic and fun way. It also features some funny competitions and adverts like an overpriced cat who shits gold. If you love humor, Viz magazine would have ample to offer you with its daunting language, black comedy, weird toilet jokes, unreal humor, violent and sexual storylines.